When Ravana came to know that his brother Vibhishana was siding with Rama, his anger crossed all limits. So, he decided to make short work of Vibhishana. Meanwhile, Rama and Vibhishana came to the battle-field. 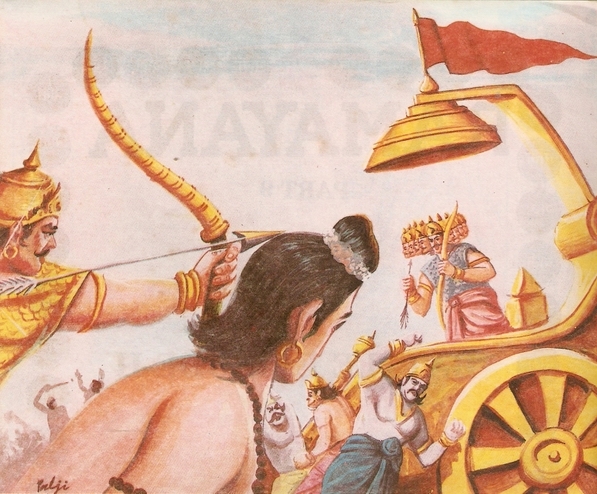 Seeing Vibhishana, Ravana could not control himself. In a fit of anger, he aimed at his brother and shot an arrow at him. 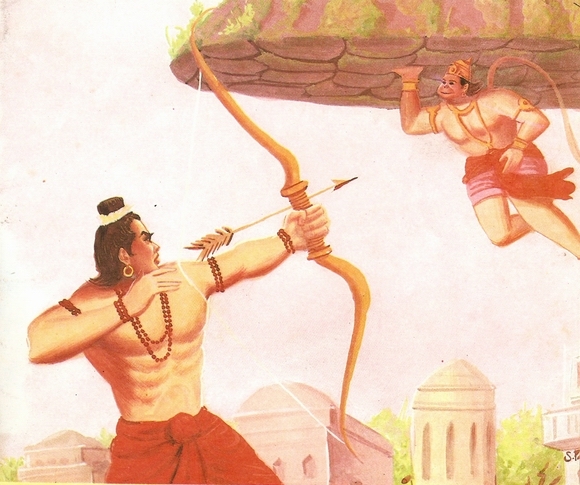 But Lakshmana shot an arrow that cut Ravana’s arrow into two. 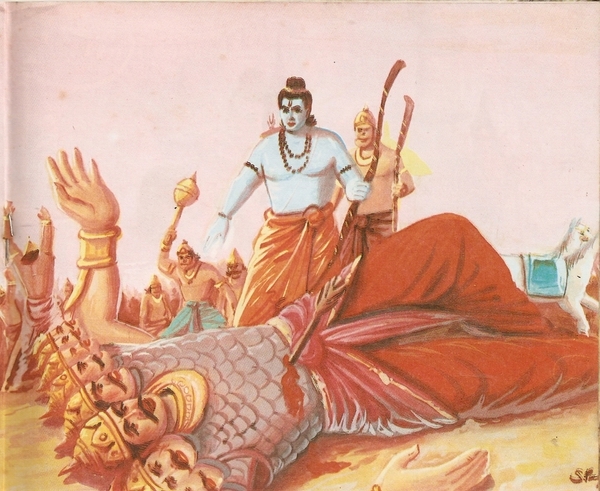 Thus Vibhishana was saved from being killed by Ravana. 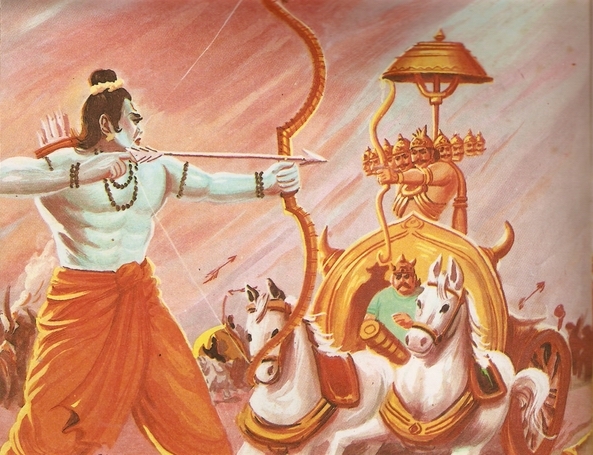 The failure of his arrow, enhanced Ravana’s wrath even more and he began to rain arrows on the Vanaras ruthlessly. It sent a wave of terror in Rama’s army and they began to fall in the action. Others lost their enthusiasm and thought of running away. Seeing this, Hanuman flew into a rage and taking his mace, he rushed to face the ruler of Lanka. He assumed a dreadful form and started killing the demon soldiers fighting on Ravana’s side. 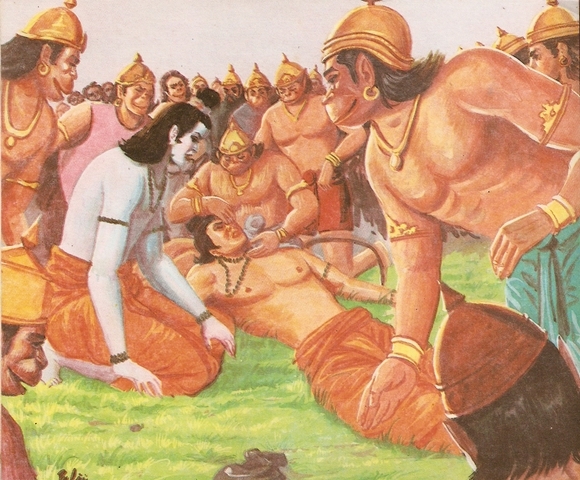 Seeing a large number of his soldiers dead, Ravana attacked Hanuman with his arrows. But these arrows could do no harm to him. Saying so, Ravana made use of a weapon that started scorching the Vanara soldiers alive. Half burnt bodies of Vanara soldiers were lying everywhere. Seeing this, Rama and Lakshmana came to face Ravana. A fierce battle was raging now. Arrows were being shot ruthlessly from both sides and soldiers were falling in large numbers. Rama and Ravana – both started using the most lethal weapons. These weapons were extremely dreadful. They struck against each other and fell down in the no-man’s land. 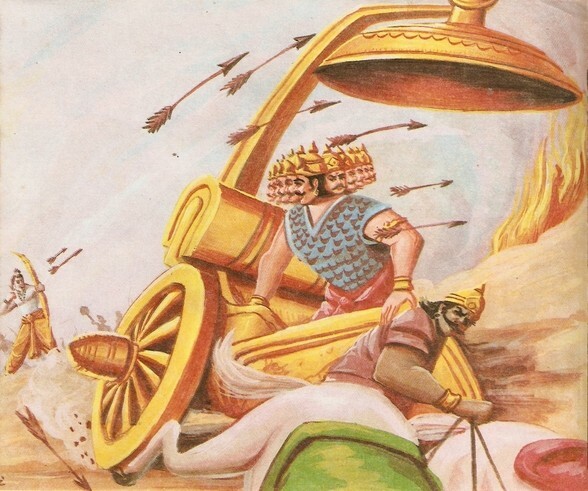 Suddenly Lakshmana started raining fierce arrows on Ravana’s chariot. It killed the charioteer and blew off his flag. 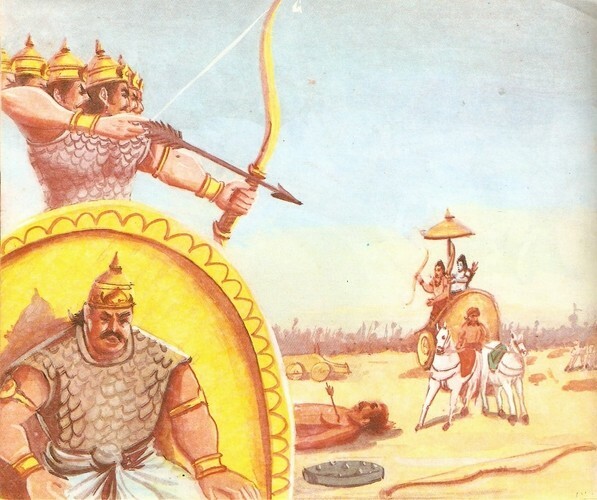 Just then Vibhishana joined Lakshmana and killed the horses of Ravana’s chariot. This enraged the ruler of Lanka and he thundered, “O Lakshmana, you seem to be so proud of your warriorship. In this intoxication, you saved Vibhishana yesterday from being killed. I must settle scores with you. I shall now use an invincible weapon on you. It will surely send you to the land of the dead. Be ready.” Saying so, Ravana flung that weapon on Lakshmana. It hit him on the chest and he was critically wounded. So, he fell down unconscious on the ground. 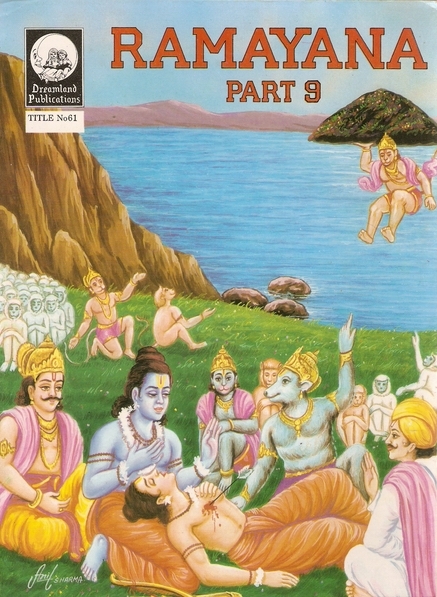 Seeing his brother senseless, Rama was plunged into deep sorrow. 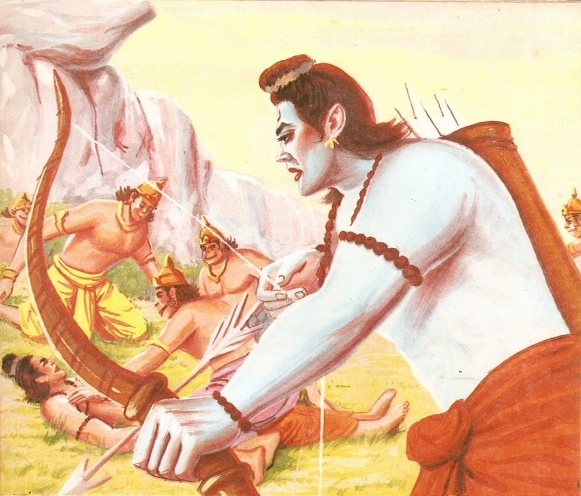 Saying so, Rama showered arrows on Ravana and wounded him very badly. Such fierce battle was being fought between the two that the onlookers began to tremble in awe. Ravana could not stand Rama’s onslaught and he fled the battle-field. 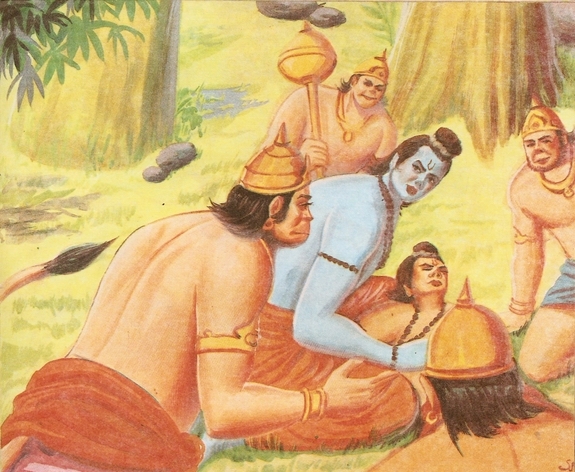 So, Rama persuaded Hanuman to go and bring the life-saving herb as early as possible. Hanuman at once proceeded on this mission. 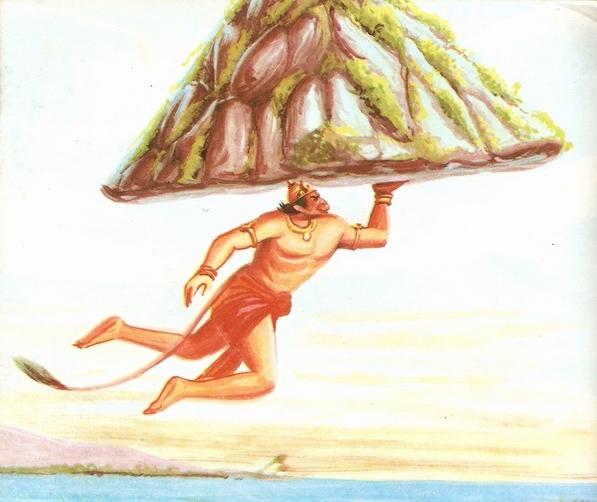 When Ravana came to know that Hanuman was going to bring the life-saving herb, he sent a demon, Kalnemi by name, to prevent Hanuman from reaching the Mount Mahodaya. The demon transformed himself into a saint and sitting across Hanuman’s way, began to invoke Rama. Seeing the saint’s hut, Hanuman asked for water. Kalnemi directed him to a nearby lake. When Hanuman was drinking water at the lake, a giant spider caught his neck. He killed the spider with a blow. The spider became free from a saint’s curse and came to its real form. It said, “You have freed me from the curse. So, I let you know a secret. The saint you met on the way is not a saint indeed. He is a demon sent by Ravana to mislead you. So, Hanuman came back to Kalnemi and killed him then and there. Then he reached the Mount of Mahodaya but he failed to recognise the herb. So, he carried a part of the mountain along with all the herbs growing on it. “I am a humble servant of Rama. I am carrying this life saving herb for Lakshmana.” Saying so, he narrated the entire incident. Hanuman agreed and Bharata did what he had said. The physician administered the required herb to Lakshmana and he got recovered in no time and got up. All the Vanaras rejoiced at the event in merriment. In a short time, Ravana moved to the battle-field on his chariot followed by all the four-wings of his army. Several other warriors too led their chariots to the field of battle. The march of the demon solders raised clouds of dust and it made the sun invisible. It caused the sea to be turbulent and the hills to lose their equilibrium. The sound of the war-trumpets seemed as if the clouds of the Doom’s day were thundering. Soon both the armies stood face to face and in the twinkling of an eye, arrows began to be rained from both sides. 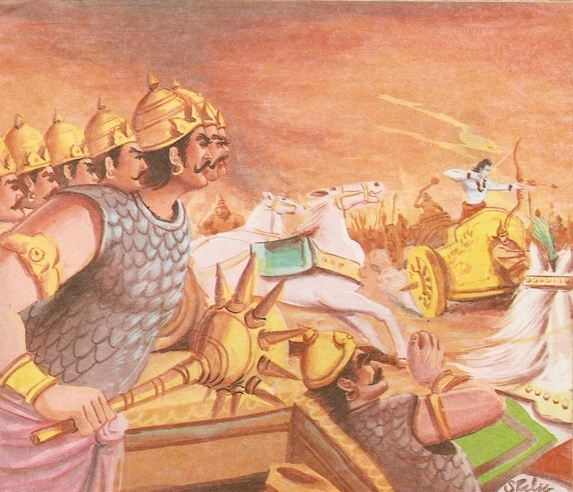 Seeing Ravana on his chariot, Vibhishana got frightened. He went to Rama who was on the ground. Red in anger, Ravana fell upon the Vanara army and began to fling the soldiers on the ground. 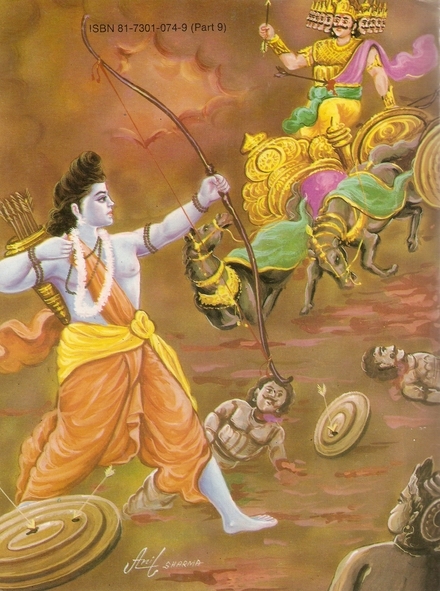 His twenty arms showered volleys of arrows on Rama’s soldiers and most of them fell in action. Those who escaped ran to Rama for help. Seeing this, Lakshmana came running to face Ravana. Directed by Rama, Hanuman and Angad barged into Ravana’s palace and said, “You shameless coward! Why have you fled from the battle-field? Why are you posing to be a saint here?” Hearing this, Ravana left his Yajna incomplete and returned to the battle-field. Ravana came face to face with Rama who prompted by Vibhishana rained fire-emitting arrows in his navel. As a result, all the nectar present there got dry. Then Rama severed his heads and arms from his body. Ravana’s headless body fell down with a thud and after smarting for a few minutes it became motionless. Seeing his brother dead, Vibhishana got plunged in sorrow. 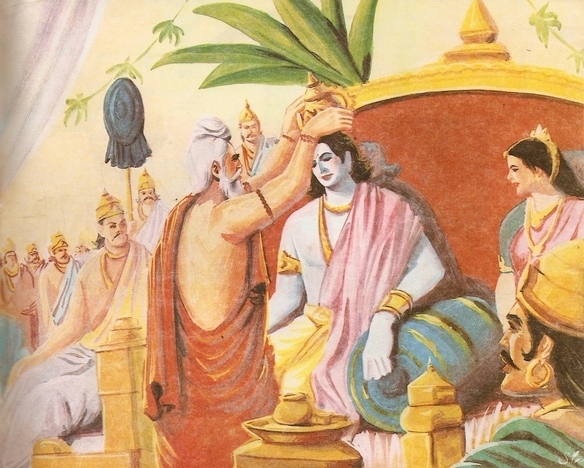 Rama consoled him and said, “Vibhishana! Be calm and perform the last rites of your brother.” Vibhishana went to Lanka and performed Ravana’s last rites. Queen Mandodari and other queens returned to the palace praising Rama for his bravery and greatness. Next day, Rama directed Lakshmana to go to Lanka along with Sugreeva, Angad, Hanuman, Nala and Jamvant and coronate Vibhishana duly because he himself escorted by others went to Lanka and enthroned Vibhishana after a ceremony. So, they went to Sita and bowed low before her. Then making her sit in a palanquin, they brought her to Rama. 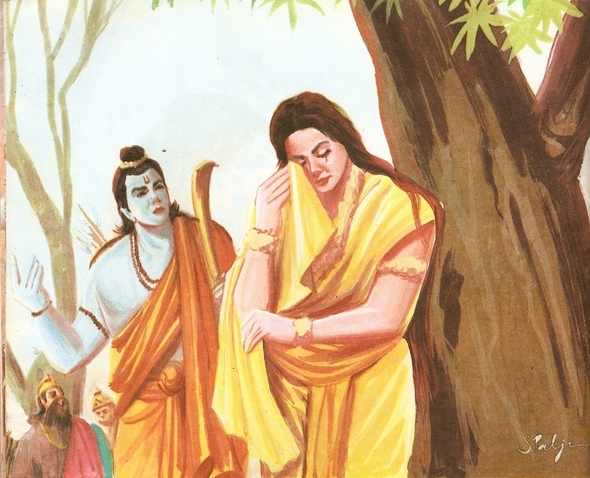 With tears in his eyes, Rama went to Sita who looked very serene at that time. She began to look at Rama in amazement but with a heart full of love and happiness. Lakshmana obeyed Sita and she , with folded hands, prayed to Fire-god “My honour is in your hands, O Lord. I don’t want to proclaim that I am pure but my husband doubts my chastity. Be kind to help me prove that I have always been faithful to him. “Let your sting be as cool as sandal.” Saying so, Sita entered the fire most gladly. Seeing this, all present there began to scream in pain. 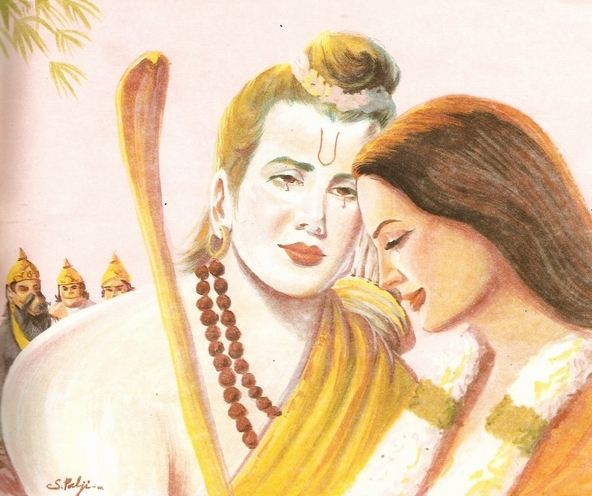 There was a hue and cry but Rama stood motionless gazing at Sita. 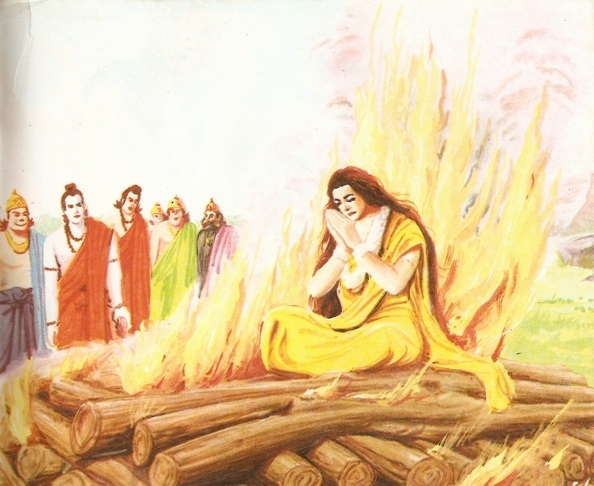 As soon as Sita entered the fire, it went out itself. 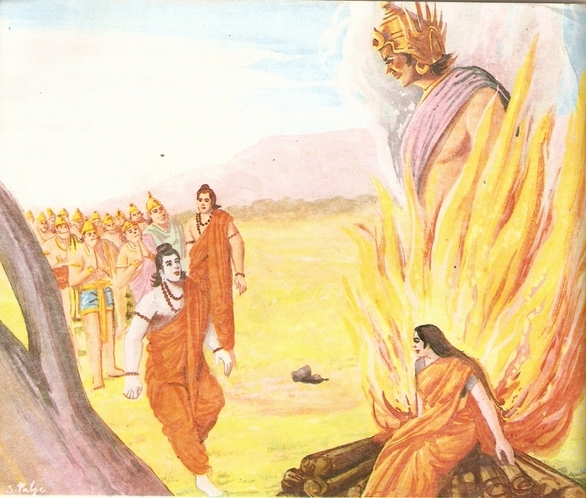 Fire-god appeared out of the fire and said to Rama, “Your wife Sita is a lady of high chastity. She is pious in thought, deed and sight even. She has not been even touched by sin or evil. She has never thought of any person other than you for a moment even. So, accept her.” Saying so, the Fire-god handed over Sita to her husband Rama. Sita was looking so charming at that time. Her complexion resembled that of the rising sun and her golden ornaments increased her charm a lot. Seeing her beauty, everyone present felt happy. They began to praise her. 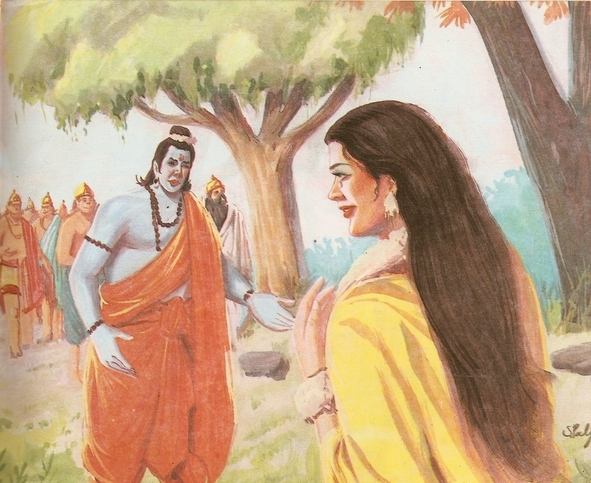 Then Rama took Sita’s hand in his own and went away. She too shed all sorrow and became as happy as ever in the company of her dear husband. Everybody who was present there felt overjoyed to see the husband and wife together once again. So, Vibhishana sent for an air-vehicle. Seating Rama, Lakshmana and Sita in it, he proceeded to Ayodhya. 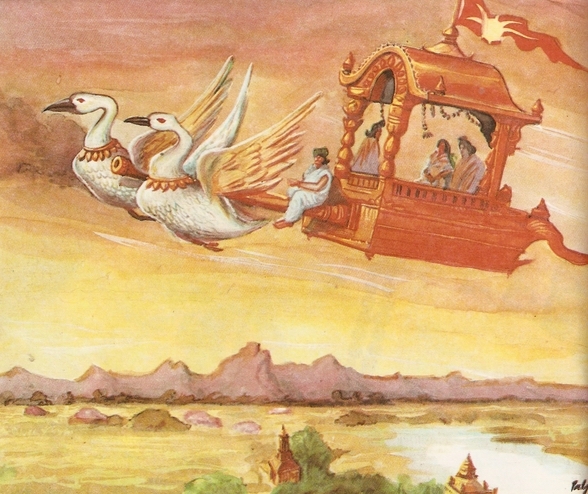 The air-vehicle flew over the battle-field which Sita was amazed to see. Then Rama show her the bridge across the sea and the Shive temple which he had built on the sea-shore. Bharat was counting the days of Rama’s exile on his fingers. Only one day was left out of the exile-period. He was lost in thoughts. He said to himself, “Only one day left, but no news of my brother Rama has reached me so far.” Just then Hanuman appeared before him in the guise of a Brahmana. Seeing Bharata’s condition, he was moved to pity. 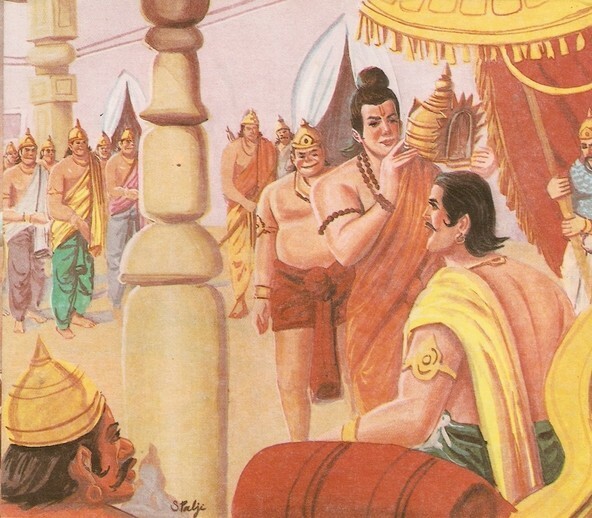 He bowed low before Bharata and informed him of Ram’s imminent arrival. “Please let everybody in the palace and also Saint Vasishtha know it,” said Hanuman. 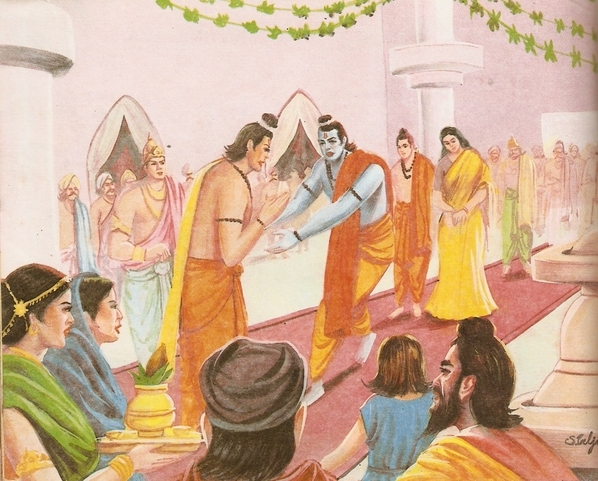 Bharata was overjoyed to know of Rama’s arrival. He sent word to all in the palace about it. The people of Ayodhya were also informed of it. A current of joy ran across the length and breadth of the town. People began to make preparations to receive their prince back. 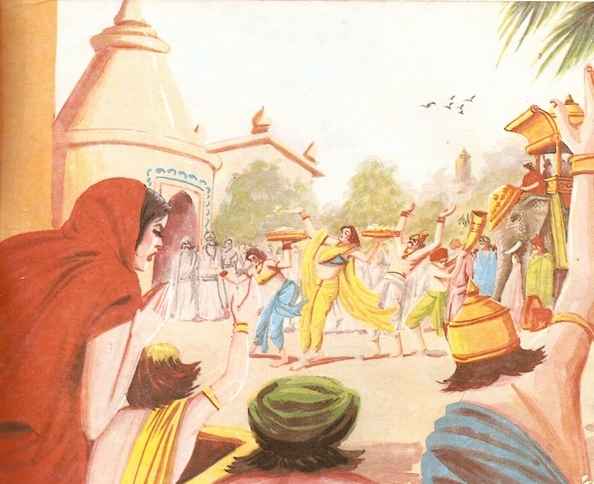 The town of Ayodhya was decorated like a bride and people stood agape gazing at the path along which Rama was to come. As soon as Rama set foot on the land of Ayodhya, he addressed Angad and Vibhishana and said, “Look! This land is my motherland. The water of the Saryu is so pious for me. It gives me perfect peace of mind. The people of Ayodhya are dearer to me than my life even. Looking at Bharata along with other people ready to welcomes, tears welled up in Rama’s eyes. Bharata lay prostrate at his brother’s feet and Rama embraced him most affectionately. Both the brothers were shedding tears of joy. Shatrughna and Lakshmana hugged each other too. Then Bharata and Shatrughna bowed low before Sita. Lakshmana also touched Bharata’s feet out of profound love and respect. So, directed by Saint Vasishtha, Rama, Sita and Lakshmana took off their forest robes. Each of them had a bath and got dressed in a royal robe. 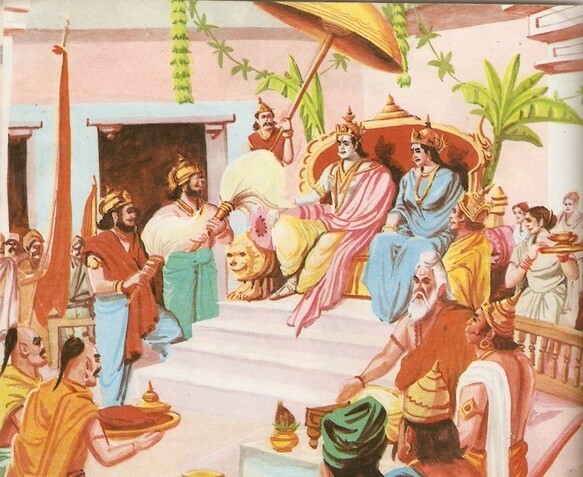 Then Rama was seated on the throne and his coronation was performed in a befitting manner. 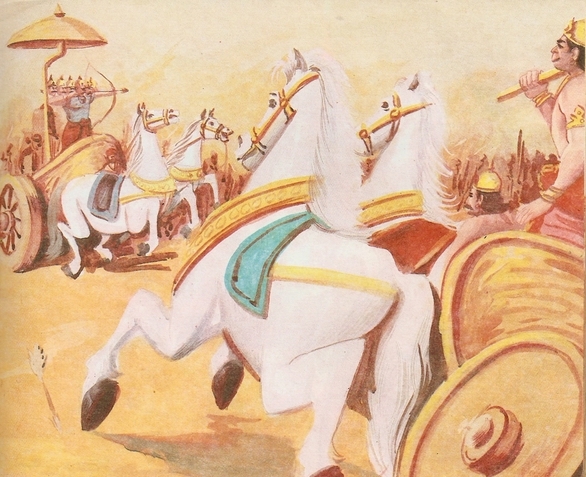 The spectators raised slogans – Victory to Rama and Sita. Hearing these words, the Vanaras stood agape. No words could come out of their lips due to emotion. Then Rama sermonised them on worldly life and showering valuable gifts on each of them, he saw them off with full honour. This ends part 9 … tune in for part 10 next week.